I have two large brochures of mid-century window treatment designs, published by Conso, the Consolidated Trimming Corporation. 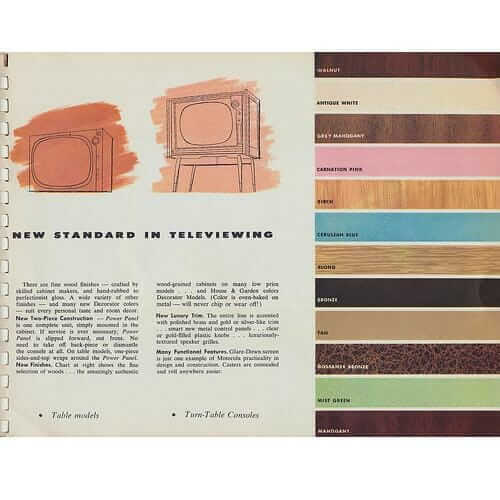 The booklets are not dated, but based on the furnishing and other hints, I put them early to mid-50s. 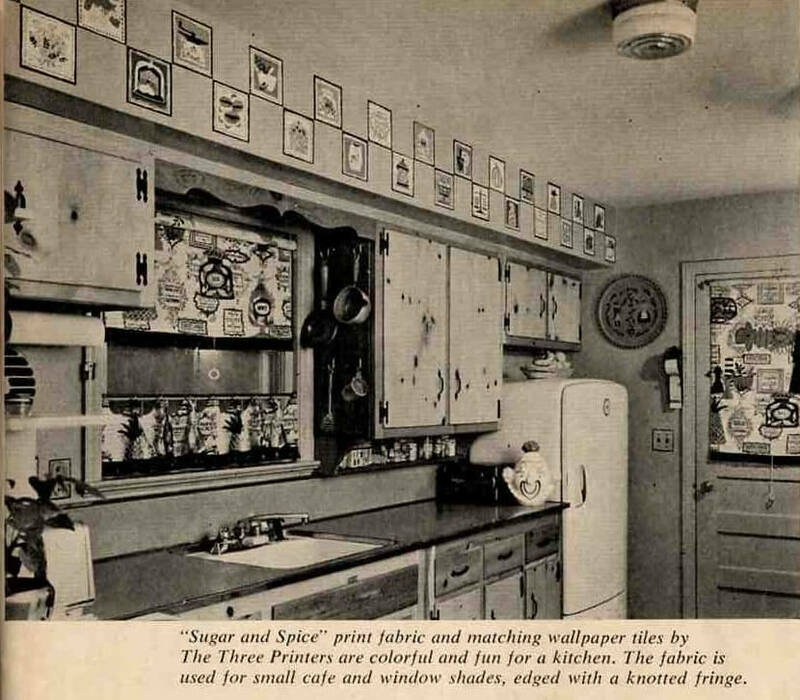 Following up on the mega-post last week about fabrics for kitchen curtains, I scanned the brochures for design ideas. 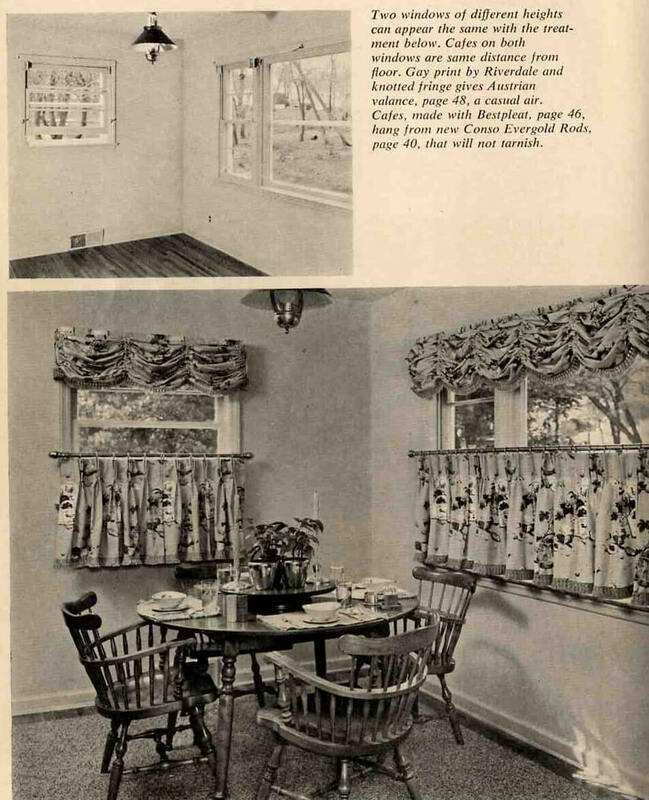 Above: Very classic… A picture window flanked by two double-hungs gets an austrian style cornice at the top, and pinch pleat cafe curtains below. The orange trim is terrific. Above: I will find out this week how to post this as a PDF so that you can get to these instructions enlarged. If you need a sewing machine – they are super easy to find at estate sales. 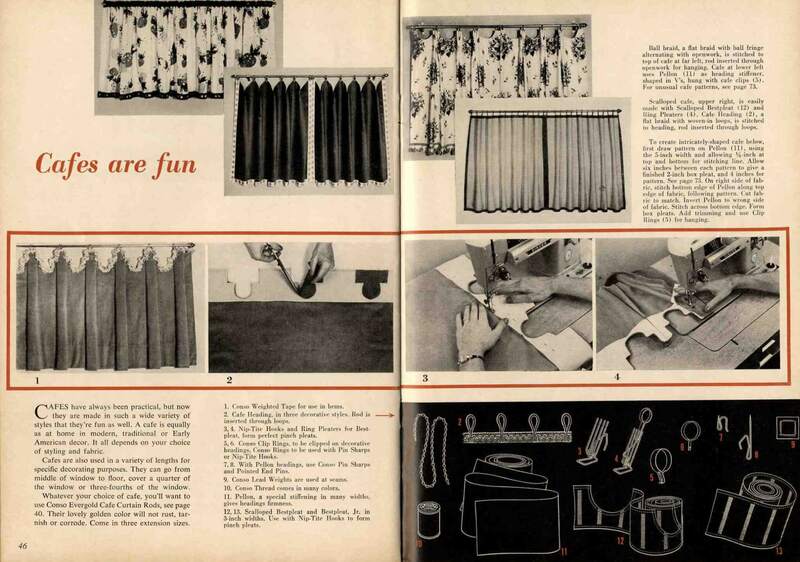 Above: These look to be scalloped pinch pleats as well. The functional idea with cafe curtains, is that you let light come in on top, but still have privacy via the cafes at the bottom. 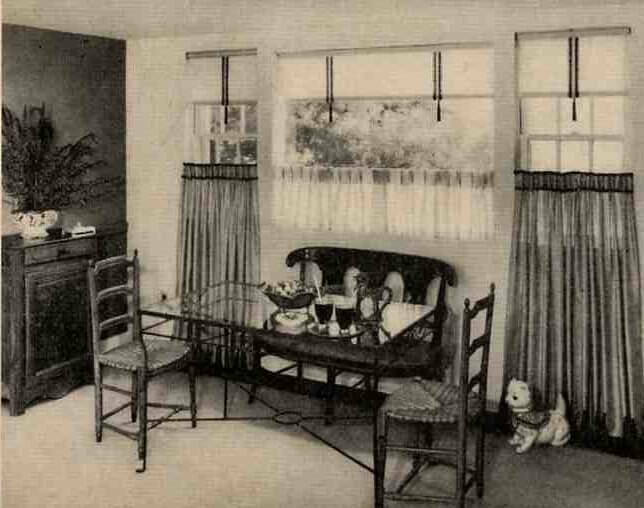 Above: More cafes in this guest room / office combo. I’m calling it that, because that couch-like sitting area surely must be a mattress, with the idea that it can provide seating when it’s not being used by guests. 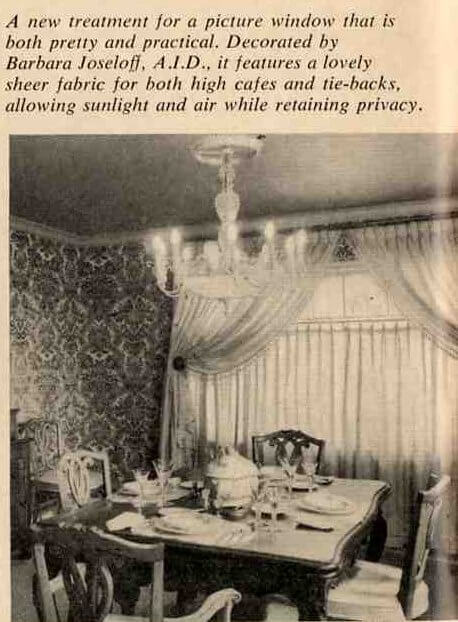 Notice with these curtains that the fabric and trim are “reversed” top to bottom. Kind of clever. Above: These are great, too. Small cafe shades give the room a little softness. They are topped by a shade – repeated on the door. Above: Here are instructions to make your own valence,. 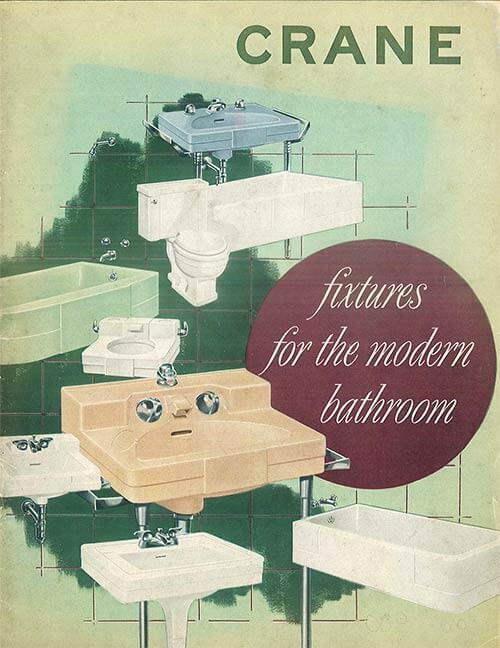 Plus – several designs to consider. Above: “Tall” cafes installed under sheers. Honestly, I’m not sure how crazy I am about this look. This booklet is from a company pushing its products, so I think there are some experimental ideas going on. 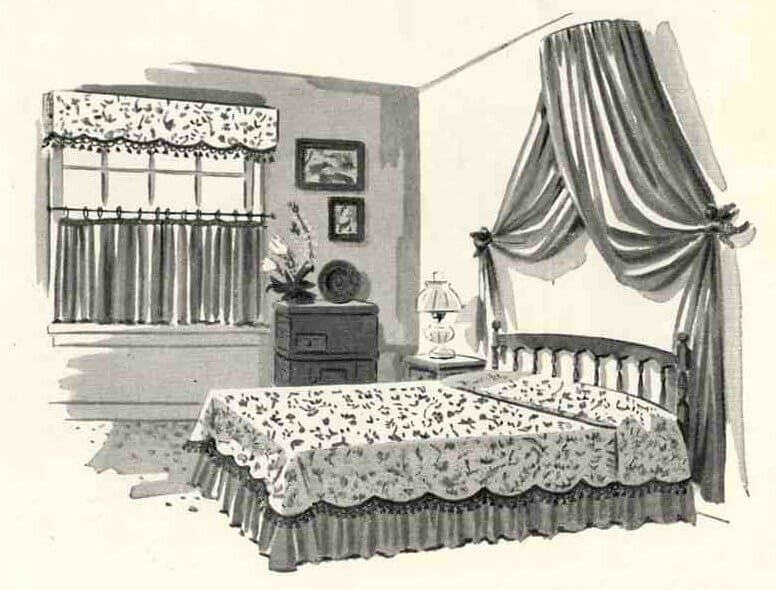 Above: A nice drawing showing how a cornice / valence can be covered in the same fabric as used for a bedspread. A very nice design effect. 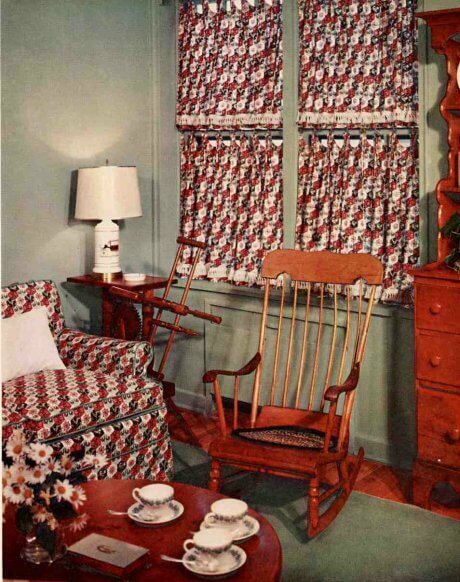 Another classic designer trick: In a living room, cover at least one chair in the same fabric as your draperies. Above: Umm, not liking this too much… Short cafe above bench. Long cafes to the right and left. I think that this window would have looked better treated as one unit, like the very first image in this post. Above: This window is actually quite interesting. 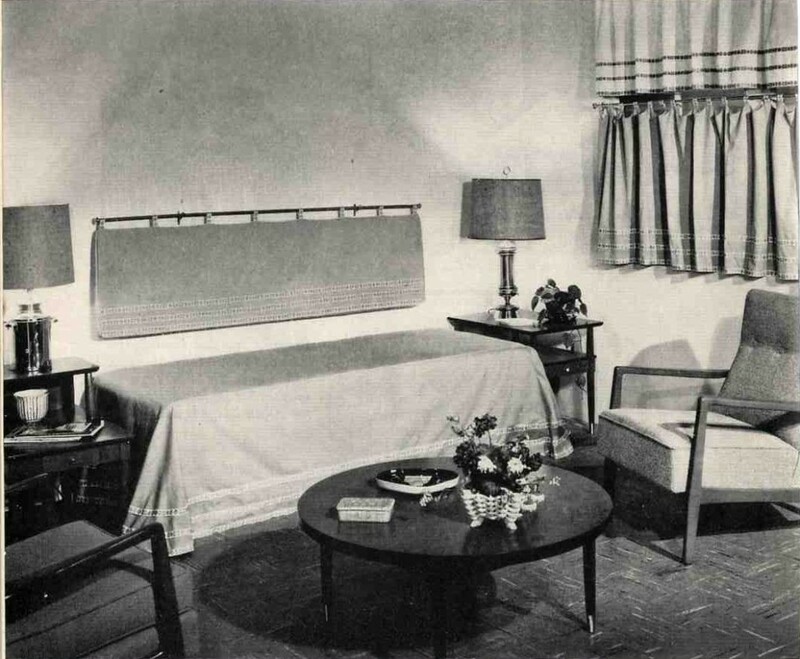 There are glass shelves behind the curtains. Kind of cool. Above: This is the third time (at least) that I’ve used this image on the blog. 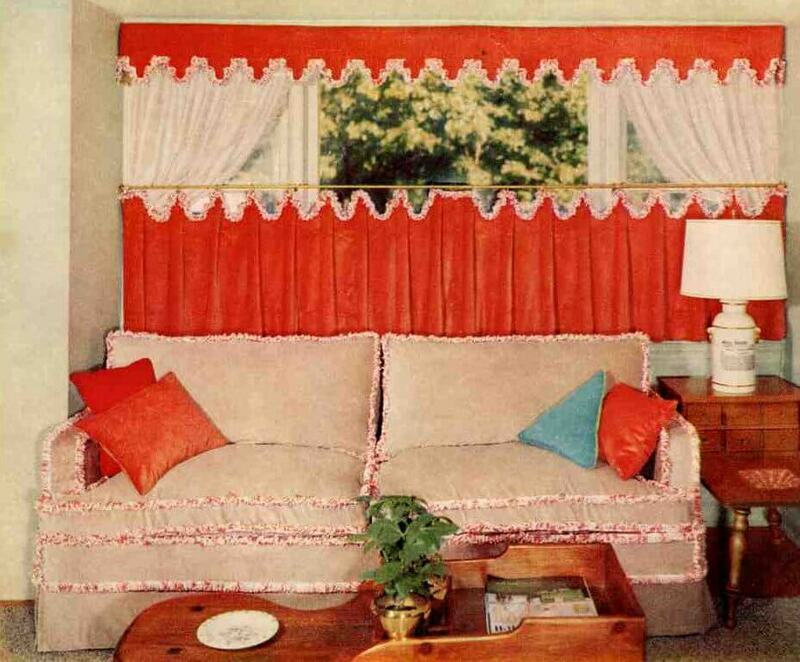 I love how they’ve used window treatments to unify the windows. This is GENIUS. Above: Finally, here’s another “problem solving” page. 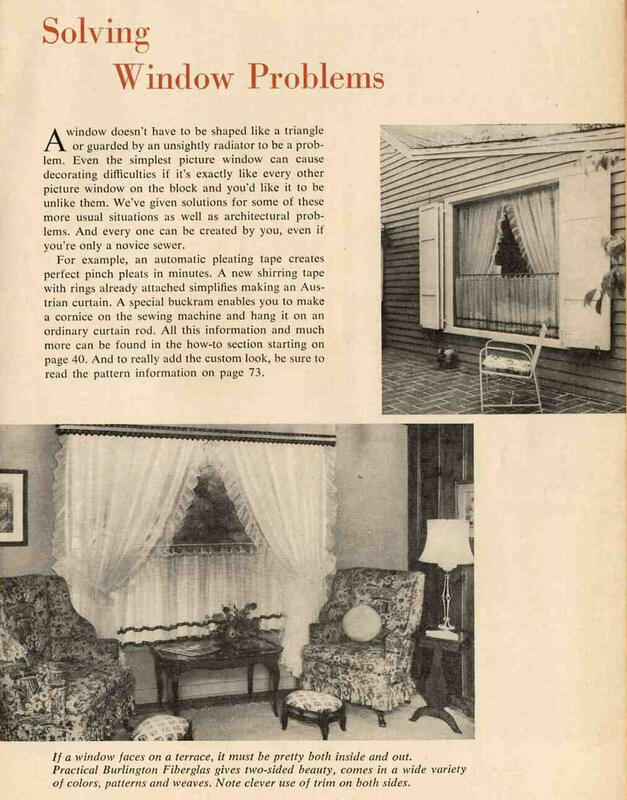 The idea was to make the window treatment look good from the outside as well as the inside. Honestly, I don’t think it they were successful. 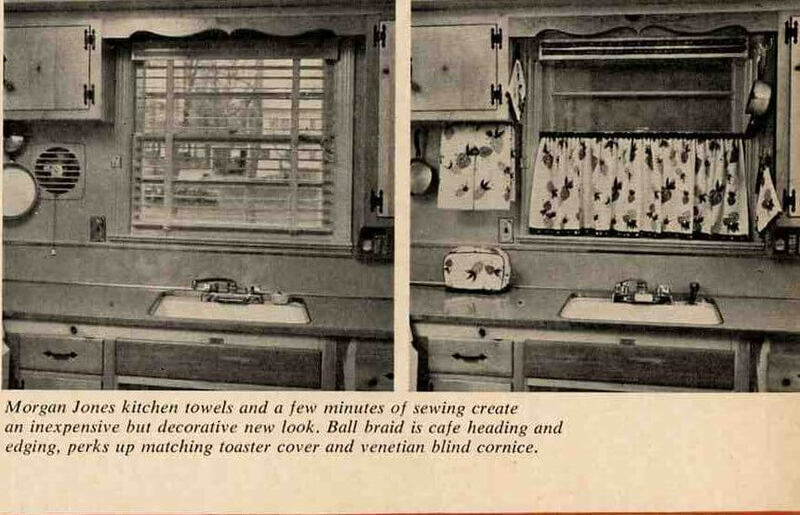 That said, I like this image because it brings us full circle to illustrating that: Cafe curtains can provide lots of utility in controlling light – and adding some design flair at the same time. 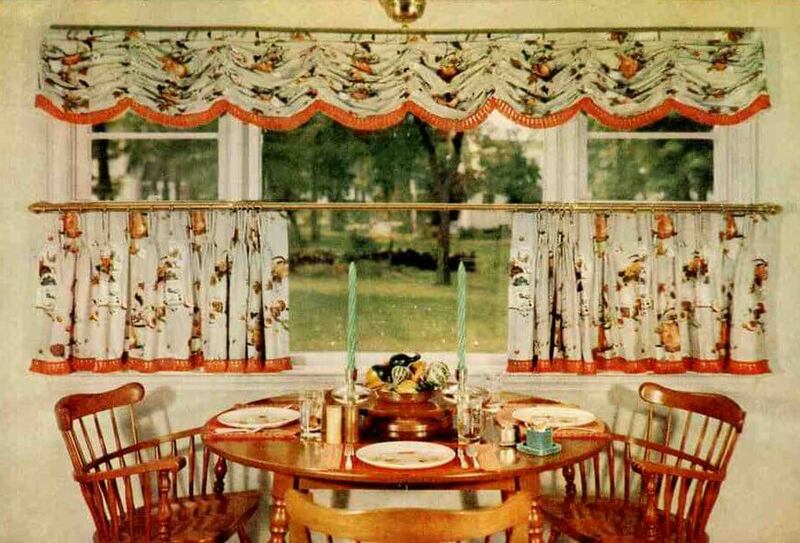 Hi, I love the look of your cafe curtains. Especially the first one, what I’m trying to figure out is how you got the lower rod to be stabilized on such a big window. That is the problem I am trying to figure out on mine. I want to put cafe curtains but the window is large and there is no place to put the middle stabilizer…how do you do it? Thanks for any suggestions you have! 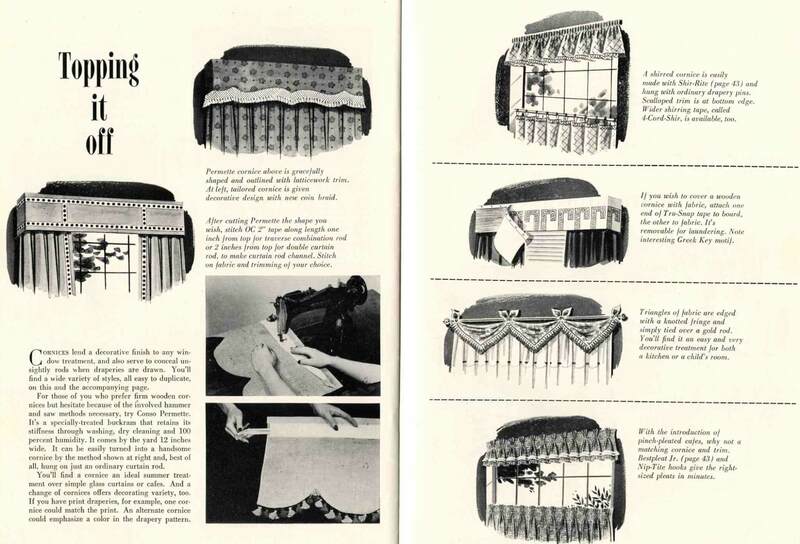 I’ll recommend a fabulous guidebook for making midcentury drapes and curtains: The Singer Sewing Book. 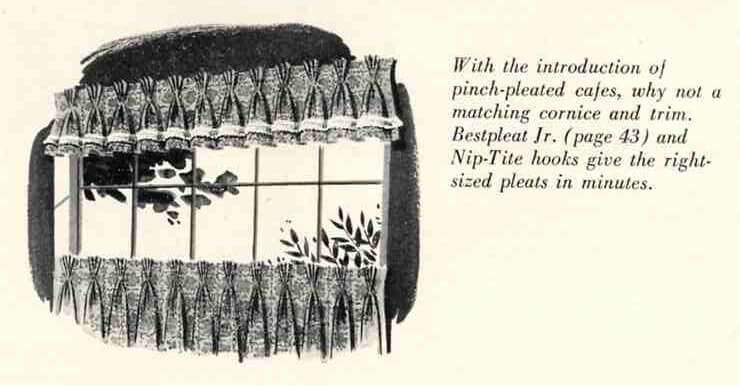 I have a copy of my mother’s 1969 edition, and it has a very detailed section on window coverings and upholstery. You can get used copies on the internet easily.